During his campaign, President George W. Bush declared support for people with mental and physical disabilities, pledging to "tear down" barriers to equality that face many of the 54 million Americans with disabilities. Immediately following his inauguration, President Bush announced the New Freedom Initiative on February 1, 2001. The President sent several proposals to Congress that would help Americans with disabilities by increasing access to assistive technologies, expanding educational opportunities, increasing the ability of Americans with disabilities to integrate into the workforce, and promoting increased access into daily community life. Click here to view the New Freedom policy initiatives. The President signed an Executive Order on June 18, 2001 supporting community-based services and programs for individuals with disabilities. This Executive Order directs key federal agencies to work together and with states to ensure full compliance with the Supreme Court's ruling in the Olmstead case (1999) and the Americans with Disabilities Act of 1990. Click here to view a fact sheet describing the Executive Order.  One component of the President's plan to promote full access to community life is the establishment of the President's New Freedom Commission on Mental Health. The Commission's mission is to study the United States mental health service delivery system, including both the private and public sector providers. The Commission will advise the President on methods to improve the system so that adults with serious mental illness and children with serious emotional disturbances can live, work, learn, and participate fully in their communities. This President's Commission is the first comprehensive study of the nation's public and private mental health service delivery systems in nearly 25 years. The report, "Mental Health: A Report of the Surgeon General," along with other materials, provides the scientific basis for much of the Commission's work. To view a copy of the Surgeon General's report, click here. To view a bibliography of the Commissioners' background materials, click here.